Congratulations to Jordan Candlish from Witherslack Group Ltd for being named January's Apprentice of the Month! He will be receiving £50 in high street vouchers. Jordan has proven to be an excellent addition to our IT team. He is hands on in solving problems and is keen to improve IT experiences for people. Jordan has created videos to assist people on using systems.Jordan has been great fit for the team and is keen to learn and contact different people when he needs help or advice on an issue. Jordan has a passion to learn about IT and the in house systems we have so he can provide the best service and support he can.We have had great feedback about Jordan and how well he works and he is now at a stage were he can make independent visit to sites on a weekly basis. Jordan is really getting into the swing of the job and is very keen to work through his tickets and sort out the issues. He's soaking up fixes and solutions like a sponge and is gaining a really good handle on the processes involved. If he is left to his own devices, he's covering incoming requests well and always finds something constructive to do. Jordan has been getting on really well with the YPs, especially on the subject of gaming, and has built up a great rapport with many of the young people. The staff seem to really like him and he always keeps up a friendly and professional manner with them. He's even been requested specifically by staff - at one site staff asked for him to go down and give advice recently when a YP had his gaming account hijacked and he was able to give them useful information and advice. He followed that up with some extra research and passed that onto staff, too, which was much appreciated. Jordan also passed his latest module with 87% as well as being given learner of the week. Bailey is very much a valued staff member! He was required to diversify his role from the off to working within our First Line Support helpdesk team advising on our e-procurement solution, and he embraced the challenge of learning our software, which expands month on month with new developments. Starting off by responding to email queries only, Bailey quickly progressed to speaking to customers and suppliers worldwide via telephone. He is courteous and diligent, knowing when to ask for help and when to use initiative, and very quickly became an integral member of the small team, respected and valued by his peers. Bailey has taken to the role with enthusiasm, and we thank him for his versatility and approach to working in a role which was still within our IT section, but not quite the assisting colleagues within the company with their IT queries he may have envisaged. He balances his studies with his workload exceptionally well, demonstrating his motivation and drive to assist the company as the same time as completing his qualification, and In-tend wish to publicly thank Bailey for fulfilling the role he’s undertaking, especially his punctuality, interest and efforts – they have not gone unnoticed! Since commencing her apprenticeship, Ally has gone from strength to strength. As a valued member of our team, Ally has an incredibly positive impact on those around her. Ally’s determination, drive and motivation see her consistently producing work of a high standard, going above and beyond for both her Baltic work and clients. This drive and positive approach hasn’t only been noticed by other team members here at Mantra but has also been noticed and praised by her Baltic trainers on more than one occasion. Throughout her apprenticeship, Ally’s training has seen her develop a range of skills in her discipline that she has then effectively applied to her wider work. By taking note of each piece of feedback from her Baltic trainers regarding her coursework and webinar participation, Ally is constantly advancing this variety of skills and depth of knowledge to impress clients. Putting in the hours to excel at her apprenticeship, Ally has a knack for time management and balancing her projects for both Baltic and the business. Ally isn’t afraid to use her initiative and her forward-thinking has been exceptional when completing her Baltic coursework and exams and using the skills she has developed to successfully execute strategies for clients. It’s exciting to see one of our apprentices achieve so much through their time with Baltic. Congratulations on your great results so far, Ally. Alison joined the company as an apprentice to assist our Business Development Director in creating content and sharing the business news, thoughts and ideas. However, Alison quickly became the leading manager of content structuring, creation and distribution. Her attitude to learning is of real value to herself and our business. Our websites and social media platforms have gained a remarkable upturn in respect of attention and following since her arrival, gaining new audiences around the world. Alison has also been exposed to active lead generation practices and after reading up on the subject, implemented various practices to widen our client target base. Having reviewed our existing practices before her arrival, Alison also implemented software to automate our processes which resulted in savings to the business equivalent to her own monthly salary. We could not be happier and prouder of Alison. Michael has grown and developed considerably within his short time here at Computacenter and has become a valuable member of my 2nd Line team. His hard work and determination has not gone unnoticed and Michael has now been offered a Permanent, Full Time Role as a 24x7 2nd Line Technical Analyst. Due to his exceptional efforts, this comes 6 months early - whilst still completing his apprenticeship. Michael has learnt numerous new skills and technologies including Wintel, Networks, Messaging and Middleware; to the point he can now train and support both new starters and existing employees with ease. Michael has a thirst for learning and his pro-active approach to day to day tasks really benefits not only himself, but his team and colleagues around him. Michael fits in well with the team and is always polite and respectful of everyone around him. He is always early to work and shows a great deal of commitment to the job. We are all extremely pleased with Michael’s progress, he has exceeded all expectations and we look forward to seeing him progress even further over the coming months. Charlotte Smith is currently on a Level 4 Apprenticeship in IT. During her time on the Apprenticeship she has always received excellent in all of here reviews and passed all of her courses with distinction. She has consistently logged time on her learning log and is over double the hours required for it. Charlotte stepped up when the previous Service Desk Manager left and organised the team rotas when no Manager was present, despite not being the most experienced member of staff at that time. Today we have completed her 9 month review with HR which is part of our in role promotion process, we have been looking to move Charlotte from Service Desk Analyst to Senior Service Desk Analyst and HR have confirmed Charlotte has met the criteria for this which is testament to her dedication and commitment. Charlotte contributed to a Baltic blog about women working in IT and received some excellent feedback on this. Her continued work with me on her personal development shows what a great asset to the RSPB she is. She is always looking for opportunities to implement Continuous improvement actions which is exactly what you want in a proactive support team. Josh is a diamond in the rough! He is a competent and valuable member of our team that is trusted to carry out any task we provide to him to a high standard. He is continually learning and does makes mistakes every-so-often, but he not only learns from these mistakes he actually looks at ways to improve the mistake to ensure that no-one else makes the same one! Josh also has a rare ability to preempt any additional queries, actions or workload that may come from the task he is carrying out and helps us future-proof the task with an If This then That (IFTTT) approach. This not only saves us time and resource but has also given us several suggestions to improve our own processes to streamline our business. To have an apprentice with his positive attitude be so proactive and selfless is not only a great character trait but is invaluable when we are looking to invest in new staff members. 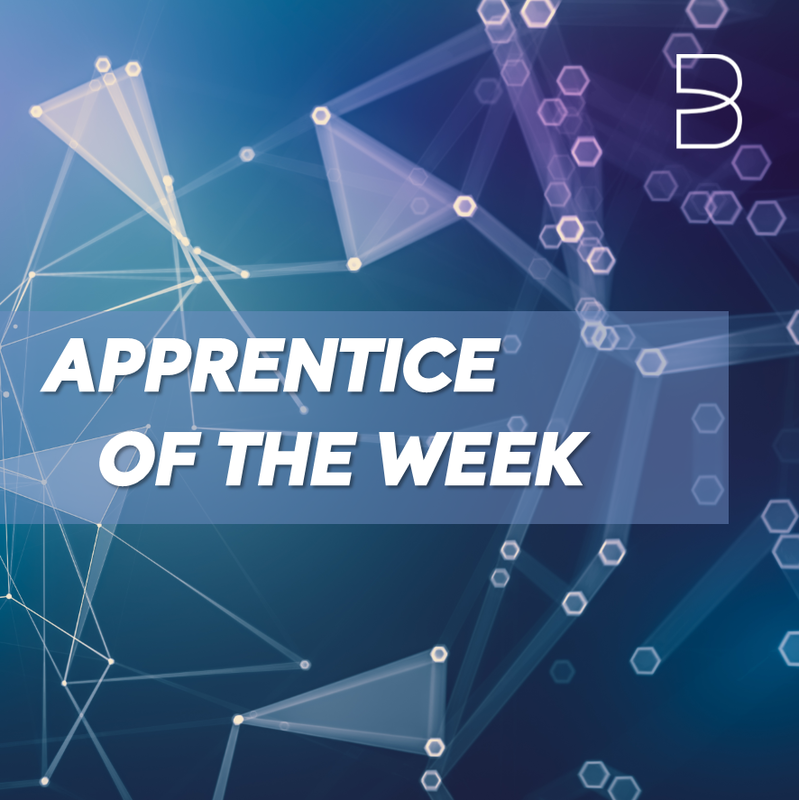 Having someone like Josh work within our high-pressure team and help us win contracts and tenders through his work as well as help us to deliver this work is why we believe Josh deserves to win apprentice of the month! I hope you can put him forward and give him the recognition he deserves! My personal experience of Daniel is a very positive one, likewise the feedback I receive from his direct line managers and colleagues, is equally complimentary and positive. Daniel has an excellent work ethic coupled with an eagerness to learn as well as an ability to apply this to his working day. Can I just make pass on a comment about one of your employees Daniel Bartrupe. What an outstanding member of your team he appears to be, he is extremely polite, efficient and I am very demanding, so not the easiest person to please. Just ask Joch. This is what another member of my team who has had recent dealing with Daniel has commented also. Ammar Patel – Daniel is really good always helpful. I cannot recommend him enough for Apprentice of the Month. I would like to suggest Jamie Brown for the apprentice of the month. This work has been recognised as valuable by senior management.Taking this into account I would recommend Jamie for Apprentice of the month. Dan has been the most amazing asset to our company – so far there’s nothing he can’t do or won’t tackle! He’s such a quick learner and his attention to detail is fantastic – he’s built us some really excellent websites to help us to grow our business. He sorts out everyone’s IT issues in a calm and efficient way and nothing is too much trouble. Dan has attended high level meetings and contributed with a level of maturity that belies his young age. He is extremely comfortable with deadlines and organises his work load effectively - with constantly changing priorities this is no mean feat. Most importantly, Dan is a true team player and a pleasure to have around, like a ray of sunshine in the office – he even played his electric guitar for us! We’re delighted that Dan has chosen to stay with us for another twenty months to complete his Level 4. With his mature attitude and great work ethic we know he has such a bright future ahead of him. We’ve had such a good overall experience with Dan and Baltic that we’re currently recruiting another apprentice. Well done Dan – keep up the good work! Nominations are now open for our Apprentice of the Year and Employer of the Year awards!